Originally published in Spring 2012 issue of TechLine Invasive Plant News. Scott Glup, project leader on the Litchfield Wetland Management District, explains that tallgrass prairie is one of the rarest and most fragmented ecosystems in North America. Protecting and preserving grasslands from invasive woody vegetation can greatly improve the quality of habitat for grassland wildlife. The Litchfield Wetland Management District (WMD) lies in the transitional zone between native woodland and prairie. Encompassing more than 40,000 acres of private and U.S. Fish and Wildlife Service-owned lands in south-central Minnesota, these protected prairies, marshes, and woodlands provide habitat for waterfowl, grassland birds, and other wildlife species. The blending of woodland and prairie biomes provides habitat for a variety of wildlife species, but also increases the risk of woody plant encroachment in prairie and grasslands. Four Minnesota Biomes. 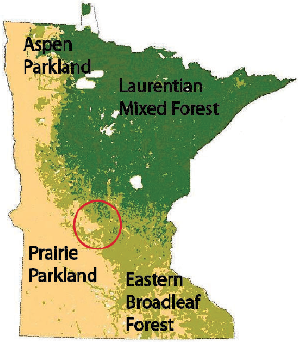 Circle indicates approximate location of Litchfield Wetland Management District in the transitional zone between woodland and prairie. “Our remnant tallgrass prairies are in a true warzone with woody plants,” explains Scott Glup, project leader on the Litchfield WMD. “Historically, wildfire and large herds of bison maintained open prairies. The loss of these natural forces, human-cause disturbance, and the introduction of non-native trees combine to threaten the existence of our remnant prairie.” For several years, the U.S. Fish and Wildlife Service has partnered with the Minnesota Department of Natural Resources, Pheasants Forever, The Nature Conservancy, National Fish and Wildlife Foundation, and other government and private partners to enhance and protect the vanishing northern tallgrass prairie in western Minnesota and northern Iowa. “Today less than one percent of the tallgrass prairie, or about 300,000 acres in the two states, remains under protection,” explains Glup. This makes it one of the rarest and most fragmented ecosystems in North America and imperils the survival of prairie-dependent grassland birds and other prairie wildlife. Research has shown that encroachment of woody vegetation into prairie grassland has a negative impact on the occurrence, density and/or nesting success of game and nongame grassland nesting birds. “It’s important to protect and preserve our grasslands from invasive woody vegetation,” says Glup. “We believe that by strategically removing encroaching trees we can greatly improve the quality of habitat for grassland wildlife.” The non-native trees and shrubs targeted for removal include invasive species such as Siberian elm (Ulmus pumila), buckthorn (Rhamnus cathartica), honeysuckle (Lonicera spp. ), and Siberian pea shrub (Caragana arborescens), as well as trees native to North America like green ash (Fraxinus pennsylvanica), cottonwood (Populus deltoides) and red cedar (Juniperus virginiana). Removing trees opens the landscape to provide more suitable habitat for birds that need large grassland blocks for breeding. The woody vegetation also attracts predators so removal of those plants gives grassland nesting birds a better chance to successfully rear their young. “We aren’t trying to remove all the trees in our district,” explains Glup. Many of the Waterfowl Production Areas (WPAs) in the Litchfield WMD have native woodlands with stands of oak (Quercus sp. ), basswood (Tilia sp. ), and black cherry (Prunus serotina). The tree removal project protects these original oak savannahs from invading trees. In many cases wildlife that use wooded areas are common and their populations are not threatened. Because grasslands and shallow wetlands are much less common, survival of plants and wildlife that rely on this habitat are threatened [Box 1]. Nick Palaia, wildlife biologist on the Litchfield WMD plans, coordinates, and monitors woody vegetation control efforts. “We use a lot of different methods to manage invasive trees and shrubs in our grasslands including fire, which is very effective on invading red cedar. The problem is that fire doesn’t provide good control of deciduous trees, so we use a variety of methods alone and in combination with herbicide treatments, and livestock grazing to maintain open grasslands,” explains Palaia. Grasslands are prioritized for tree removal based on size of the grassland, wildlife habitat value, and potential for long-term protection from encroaching woody invaders. Thousands of acres of prairie have been protected from invasive woody trees since 2005 when the District expanded their tree removal program. Tree removal is done in all seasons; however the bulk of work in the Litchfield WMD is done later in the year. Fall and winter are optimum times to remove trees because soils tend to be firm and dry in fall, or frozen in winter, which reduces damage from heavy equipment. There is also less impact to wildlife such as nesting birds. What methods has the Litchfield WMD found most effective for selectively controlling trees? “It depends on the tree species, size of the tree and density of the infestation,” explained John Haffley, biological technician on the WMD. “When you cut down red cedar the tree is killed. But green ash, elm, cottonwood and box elder will re-sprout, so herbicide treatments immediately following cutting are important for complete control.” The district uses a 20% solution of Garlon® 4 Ultra (2 quarts Garlon 4 Ultra to 2.5 gallons bark oil) for most of their cut stump treatments. Box elder proved more difficult to control, so in 2010 the District started including Milestone® in combination with Garlon 4 Ultra to stop re-sprouting. “We mixed 0.5 to 1.0 fl oz of Milestone and 2 quarts of Garlon 4 Ultra to 2.5 gallons of bark oil and were able to get much better control of re-sprouting on box elder,” says Haffley. District employees and contractors utilize tools ranging from hand clippers to large equipment for controlling encroaching trees. The Dymax shear mounted on a skid steer is used to cut large trees six to 16 inches in diameter at ground level and apply herbicide to the cut stump. “This piece of equipment is almost indestructible, it cuts large trees and applies herbicides to the cut surface at the same time,” says Haffley. The shear saves time and resources since there is no follow up with a separate herbicide treatment. Other equipment, including a carbide cutter that grinds trees up to three to four inches in diameter, and a timber ax are more effective on high density stands (thickets) of invasive woody shrubs like buckthorn and small trees. Haffley explains, “The timber ax cuts cleaner but is not as rugged as the carbide cutter and needs to be used in rock-free landscapes.” Once thickets of small trees are cut, they are allowed to re-sprout and the canopy is broadcast sprayed with either Garlon® 4 Ultra alone or a mixture of Garlon 4 Ultra and Milestone either in July following cutting in winter, or in the fall following summer removal. Special funding for control of non-native trees and woody plantings allow the Litchfield WMD to remove trees in abandoned windbreaks and around homesteads, which are a seed source continually re-infesting adjacent grasslands. These were some of the first areas that the Litchfield WMD targeted for removal. Private tree-removal contractors are encouraged to send commercial logs to a mill for use as building material, or use wood from smaller trees as biomass to produce energy. Recent technological advances in renewable energy are increasing the feasibility of utilizing wood from these habitat restoration projects. The Litchfield WMD is protecting and improving the quality of prairie fragments for prairie-dependent wildlife through well-planned tree removal. Long-term management to prohibit re-infestation by trees includes diligent use of a variety of management techniques such as periodic fires to maintain historic prairie landscapes. “The Litchfield WMD aggressive prairie restoration effort is based on the best available science and the need to restore habitat for dwindling prairie wildlife,” says Glup. An annotated bibliography on The Effect of Woody Vegetation on Grassland Nesting Birds by Kristel K. Bakker, College of Arts and Sciences, Dakota State University Madison, SD 57042 (updated 2008) can be requested by emailing diane_granfors@fws.gov. ®Trademark of Dow AgroSciences LLC. State restrictions on the sale and use of Garlon 4 Ultra apply. Consult the label before purchase or use for full details. Milestone is not registered for sale or use in all states. Contact your state pesticide regulatory agency to determine if a product is registered for sale or use in your state. Label precautions apply to forage treated with Milestone and to manure from animals that have consumed treated forage within the last three days. Consult the label for full details. Always read and follow label directions. Protecting prairies: US Fish and Wildlife Service manages invasive woody plants. By Celestine Duncan. www.techlinenews.com, TechLine Newsletter. April 2012.